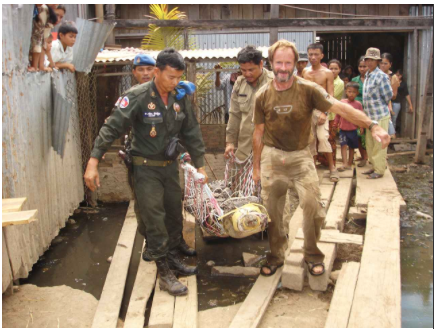 Nick Marx, Wildlife Alliance, with Wildlife Rapid Rescue Team in Cambodia rescuing a crocodile from trader's home. Photo courtesy of Wildlife Alliance. Nick Marx of Wildlife Alliance talks about rescuing wildlife from illegal trade in Cambodia. He tells “The WildLife” host Laurel Neme that since 2001, the Cambodian government has cracked down on the illegal wildlife trade with the Wildlife Rapid Rescue Team (WRRT), an inter-agency wildlife crime investigation and counter-trafficking unit of the Forestry Administration and Royal Gendarmerie of Cambodia operating with technical and financial support from Wildlife Alliance. To date, the Wildlife Rapid Rescue Team has rescued more than 40,000 live wild animals, raided hundreds of restaurants, markets and shops illegally selling wildlife, set up check points on roads and dramatically reduced wildlife crime in Cambodia. Whenever possible, live animals rescued by the team are released back into the wild. But when the rescued animals need medical attention or are too young for release into the wild, they are taken back to the Phnom Tamao Wildlife Rescue Center for care. The Phnom Tamao Wildlife Rescue Center is situated less than an hour away from Cambodia’s capital of Phnom Penh and is currently home to over 1,200 animals rescued from the illegal wildlife trade.